Home Football Who was top of the class? Who was top of the class? ARE you one of the many people who were thrilled by another memorable season of schools’ Gaelic games? If so, why not cast your vote for the top player of the year in both football and hurling? Voting is open to the public from today for the Danske Bank/Irish News Ulster Schools’ Player of the Year. Since September, players of the month in both codes have been selected, and with some excellent games to look back on, the competition to be named the best overall individual is sure to be fiercely contested. In football, just to take one game, there was a brilliant Ward Cup decider between Gairmscoil Chú Uladh from Donegal and St Mogue’s, Bawnboy from county Cavan at the end of February, which the latter won 3-10 to 2-9. And, of course, the schools’ finals double-header from a fortnight ago is still fresh in the memory, with St Michael’s, Enniskillen winning a thrilling MacRory Cup final against Omagh CBS and then going to do Ulster proud at the weekend by reaching the Hogan Cup final. St Patrick’s, Downpatrick couldn’t emulate them on a national stage but they had many quality players in their ranks who guided them to MacLarnon Cup victory over Cathair Doire at the Athletic Grounds. In hurling, one of the games that stood out was the Casement Cup final in November. That was won by St Patrick’s Academy, Dungannon, who defeated St Mary’s, Magherafelt on a scoreline of 2-22 to 2-9. 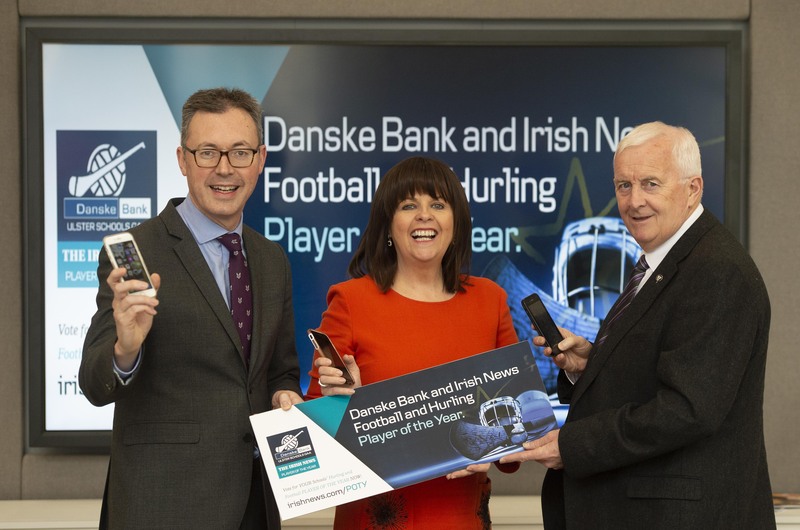 Oonagh Murtagh, Danske Bank head of South Business Centre explained that the Ulster Schools’ Player of the Month awards were launched this season to provide an opportunity to recognise great player contributions across both football and hurling, regardless of the player age or team level in the game. “We have selected 12 very talented players of the month, six in each code and each one worthy of the Player of the Year accolade,” she said. “The Danske Bank/Irish News Player of the Year open vote gives that say back to the Ulster Schools’ GAA community – the dedicated coaches, everyone who helps prepare the team for their matches, to all who support the players, including families and friends as they see first-hand the level of commitment the players give year round. Irish News marketing manager, John Brolly said: “The Irish News is delighted to be working in partnership with Danske Bank and Ulster Schools to highlight the talented players there are right across all levels of the Ulster schools’ football and hurling competitions. Jimmy Smyth, Ulster Schools chair, added: “The beauty of the Danske Bank Ulster Schools’ Player of the Month Awards is the fact that the original nomination comes from the opposing team management, so you can’t ask for closer scrutiny than that. “All were voted worthy monthly winners and as in the past, the decision for Player of the Year rests with the public, and rightly so. “Congratulations to all who have made it thus far, and we look forward to seeing everyone at the Allstar awards.” To cast your vote all you need to do is go online to www.irishnews.com/POTY You can cast one vote per email address Voting opens today and closes 12pm Wednesday, April 10. The football and hurling player who receives the most votes will win the Danske Bank/Irish News Ulster Schools Player of the Year which will be announced at the Danske Bank Ulster Schools All-stars gala awards night on Friday, April 12. Anyone who votes will go into a draw selected at random to win one of five £50 O’Neills vouchers.